This piece originally appeared on MyRecipes.com. Okay, hear me out: Pie is wonderful. While pumpkin, pecan, and apple pie can certainly have a place on the Thanksgiving menu (there’s plenty of room), there are so many other seasonal, grade-A desserts out there that are worthy to adorn your turkey day table. Consider this your official challenge to expand your holiday dessert perspective this year and venture into the land of insanely-delicious, alternative uptakes on classic Thanksgiving sweets. These impressive, top-rated treats might just be gone long before the pies are even sliced. #1. 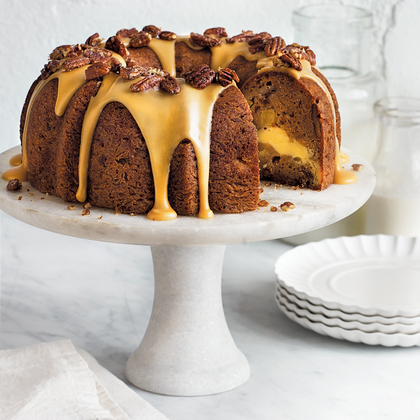 There’s something about a voluptuous round bundt perched high atop a cake stand, with a mouthwatering glaze streaming down its sides, that screams show-stopper. And this Apple-Cream Cheese Bundt Cake (pictured above) is no exception. With over 100, 5-star reviews, this recipe proves that it’s worthy choice for your Thanksgiving table. Apples are at their seasonal-peak right now, and this sweet cake with cream cheese filling and homemade praline frosting is the perfect way to showcase them. Applesauce adds moisture to the cake batter which also calls for 3 cups of peeled and finely chopped Gala apples. Garnish the glazed cake with additional toasted pecans. #2. Carrot cake at Thanksgiving?! Yes I am, in fact, suggesting you make this classic layer cake for your pinnacle fall feast for a number of reasons. First of all, it’s not called our Best Carrot Cake for no reason. This is the top recipe for carrot cake in the entirety of our recipe database, and it has over 250, 5-star reviews. Chrissy Teigen (John Legend’s wife and Sports Illustrated model) discovered the recipe on our site earlier this year and took to Instagram to share her obsession with it–if that tells you anything about how perfectly sweet, moist, and absolutely scrumptious this recipe is. And while I’m all for pie at Thanksgiving, I’m really a cake girl at heart, and this classic seasonal spiced cake with mouthwatering cream cheese frosting is exactly what I’m craving this year. To save time, we suggest buying pre-shredded carrots and making the layers a day ahead to allow plenty of time for them to cool completely. If you attempt to turn them out too early–you’ll end up with a crumbly mess (why, yes, I know this from experience . . . but I also know your guests will still devour said crumbly mess). #3. This Pumpkin-Pecan Cheesecake combines 3 holiday favorites: pumpkin pie, pecan pie, and cheesecake. This dessert packs in all of the fall flavors I love–including delicate pumpkin depth, toasty pecans, and sugary-sweet homemade praline glaze. Several reviewers have dropped pumpkin pie altogether at Thanksgiving in favor of this recipe. That’s a high compliment to cheesecake, people. One tip: Make this dessert the night before so it can set. #4. The picture doesn’t nearly do this Caramel-Apple Galette justice, but trust me–with slight notes of tang from the lemon juice and Granny Smith apples balanced by rich caramelized sweetness, this cinnamon-sugar French pastry is a fitting end to your hearty Thanksgiving meal. Feel free to add a scoop of ice cream or dollop of homemade whipped cream on top of each serving. I’m sure no one would complain. Because of the crust, it still feels like you’re eating pie–albeit with an elegant, rustic upgrade. If it’s not baked in a pie plate, I’m not calling it a pie right now–my house, my rules. Little pro tip from our friends at Cooking Light: Instead of cutting the apples into wedges, try a different look and cut the whole, unpeeled apples in half crosswise and then thinly slice into 1/8-inch-thick rounds. Carefully remove the seeds for a beautiful star shape. Oh, and did we mention it saves major time by using refrigerated dough? Now that’s my kind of shortcut. #5. We talk about this Pumpkin Pound Cake recipe a lot around here, but that’s because we wholeheartedly believe in it. It’s sweet but not overly so, and the buttermilk glaze is the perfect addition when drizzled over the tender, warm cake. This is one of those recipes you’ll be printing out for your recipe box, sharing with your friends, and making for years to come–you have my word.